These boots are waterproof with a oil-resistant rubber sole perfect for any working man. J-Flex Flexible Comfort System® with removable orthotic insole insert provides exceptional comfort for all day wear. 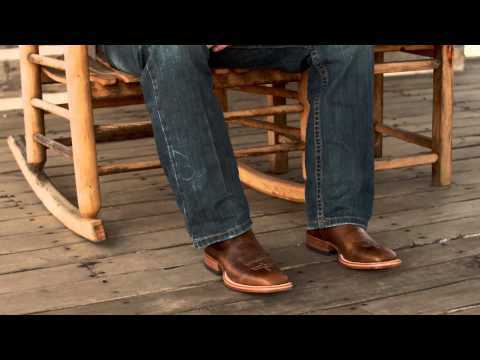 Sunset Rage Waterproof is an 11-inch tall men's George Strait 031 boot with a J17 toe and a unit heel and J-flex flexible comfort system insoles. They also have a removable orthotic insole insert. This is at least the 3rd pair of these boots I have had. They fit like house shoes and wear a long time. I wear them every day, have 1 for nice work and another for outside dirty work. Love these boots! Love the boots great price! Love these boots. Comfortable, warm, durable. I bought a pair for myself two years ago, then bought this pair as a gift and the recipient LOVES them. Can always trust Justin products. Purchased from State Line based on recommendation from a friend who is a satisfied customer; this was our first order. I'd searched other sites and was unable to locate this particular style; my friend's husband had just ordered a pair for himself so I logged on and ordered. The boots arrived in a timely manner and the price was a savings which is always a plus. 4th pair. Great boots. Too many marketing emails. Great boots at a good price but I will not buy from state line tack again because of the deluge of marketing emails following the purchase. Just as I hoped these boots would be! Will re-order if and when these need replacing. I purchased these for my son who is outdoorsy. He wears them all the time. These are probably the most comfortable Justin Boots he has had so far. They are true to size. They have a comfortable insole. They are holding up perfect for my active son. My second pair. Received my first pair by chance. My second by experience. I will have a pair as long as they are manufactured.The most comfortable boot I have ever owned. They fit great and are easy to put on and off. Required no break-in, felt great the first time I put them on. They are water proof and rugged, last a long time. The size of boot that I ordered was a 9-1/2. they were sized at least a 10-1/2 and they swallowed me up and were very loose fitting, the reason for the low review is I had to pay the return shipping on the product which was not my fault they were sized wrong. If I had made the mistake I would have gladly paid the fees for returning, but where I had no control or say it irritated me to the point that I would probably not buy anything from stateline tack again if I wasn't sure of the fit!!! These boots are so comfortable. They feel more like tennis shoes. I have ordered this boot the last 3 times I have ordered boots. They fit your foot like it has been broke in already. This is a tough boot for work or play, It is water proof which is one of the best reasons to purchase, price was a good deal to. Love this boot. Very comfortable, warm, easy to walk on metal roofs. I can wear these boots all day without knee pain. This is my second pair and I am thinking about buying another pair for a spare. BEST ANSWER: Order a half size down. Yes. They are true to size. These are the only boots that my husband will wear. No break in period. He puts them on and goes. I have had 4 pair and they have all fit like a glove out of the box. I think they are great boots. Very comfortable. Yes, they were a perfect fit for my husband. He has a small foot and I ordered his normal size, no problem at all. Yes, the pair I purchased was. These boots do not come in size 7-wide? BEST ANSWER: Unfortunately it looks like the wide widths start at size 8EE.